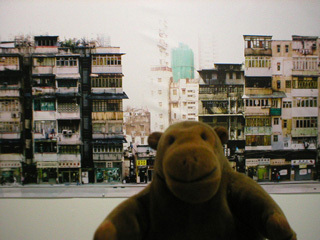 "I'm not sure tin foil is really sturdy enough to build a kitchen with"
Mr Monkey examined Lee Tung Street For/On Sale, a vinyl banner made up of 300 images by the Community Museum Project. 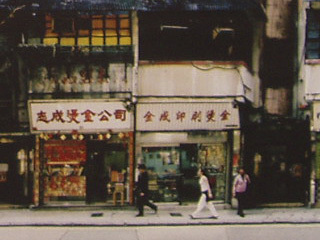 The montage includes every apartment and shop in the street, which is scheduled for redevelopment*. Mr Monkey did notice that there seemed to be a lot of fire damage along the street. 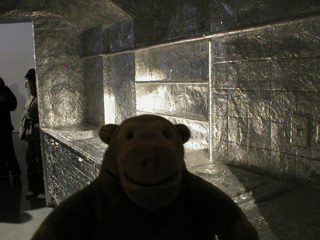 Then Mr Monkey peeked into Bok Gwai, a kitchen mostly made out of tin foil takeaway cartons by Anthony Key. Mr Monkey was mildly peeved that he wasn't allowed to scamper inside the tin foil kitchen, but even a monkey can't have everything. * Which really means demolition.